Prince: "The internet's completely over"
Prince has claimed that "the internet's completely over." In an interview with London's Daily Mirror, the maverick artist said, "I don't see why I should give my new music to iTunes or anyone else. They won't pay me an advance for it and then they get angry when they can't get it." 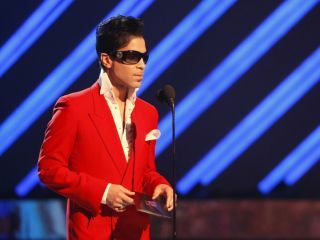 Prince is releasing his new album, 20Ten, on Saturday (10 July) in copies of the Daily Mirror and Scotland's Daily Mirror. Which begs the question: If he can't get an advance from iTunes, what good is it to release his music free of charge inside of newspapers? Such is the way that Prince's mind works. In 2008, he closed down his official website (he started up a pay site called LotusFlow3r which eventually folded), and he's also done his best to remove his music from iTunes and YouTube. A couple of years ago, he even went so far as to have his cover of Radiohead's Creep barred from the popular video site - until the band stepped in and demanded that Prince's version of Creep, from a performance at Coachella, be reinstated. "The internet's like MTV," Prince continued. "At one time, MTV was hip and suddenly it became outdated. Anyway, all these computers and digital gadgets are no good. They just fill your head with numbers, and that can't be good for you." When asked about the title of his new album, 20Ten, he said, "I just think it's a year that really matters. These are very trying times." The devout Jehovah's Witness also said that "people, especially young people, don't have enough God in their lives."